Boshan Mountain incense burner, popular during the Han Dynasty (206 BC-AD 220), provided by Hebei Provincial Museum. "Such was the continuity and wholeness of Chinese civilization that anything brought to it and considered foreign would ultimately be internalized once it was adopted," says Zhao Liya, a book editor turned historian who has just written for the catalog of an exhibition at the Cernuschi Museum in Paris titled the Perfumes of China - the Incense Culture of the Imperial Times. The exhibition is a joint effort of the French museum and the Shanghai Museum. "When foreign spices entered China in huge quantities during the Tang Dynasty (618-907) between the early seventh and the early 10th centuries, it smelled exoticism, and it was in this that their attraction mainly resided." 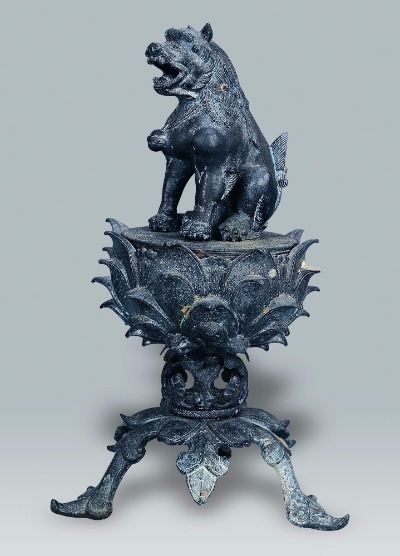 Bronze lion-on-lotus incense burner dated to about one millennium ago. These spices included, most famously, musk, a strong-smelling reddish-brown substance secreted by the male musk deer. Another was ambergris, a solid, waxy, flammable substance that was dull gray or blackish, produced in the digestive system of sperm whale. The former came largely from the Eurasian steppe, where the deer roamed, and the latter is believed to have been swept ashore by waves of the Arabian Sea. Both eventually arrived in Tang Dynasty China through the Silk Road, a winding route that threaded its way across Eurasia, connecting ancient China with cities as far-flung as Rome and Alexandria. 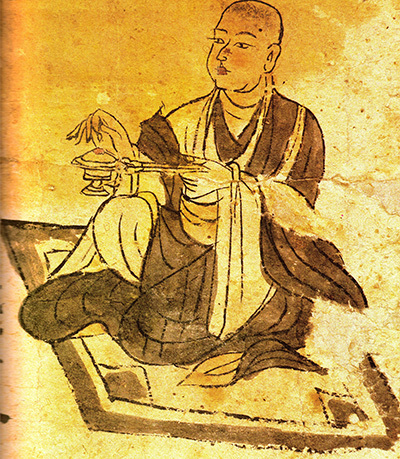 However, Zhao says, a little more than half a century after the demise of Tang, the Song Empire (960-1279), founded after a brief period of chaos and fragmentation, imbued the spice culture with new significance, a meaning rooted in the past and considered today as quintessentially Chinese. 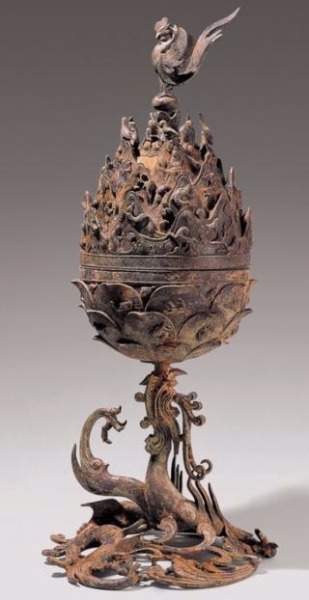 Bronze Boshan Mountain incense burner unearthed in South Korea, attesting to ancient China's exportation of its scent culture. "During the time of Song, incense-burning became an integral part of the life of the literati, whose traditions and values were celebrated by the whole of society, from the emperors down," Zhao says. "Consequently, the whiff of luxury previously associated with using expensive spice gradually faded, replaced by a more casual, relaxed attitude. "Inhaling scent was supposed to nurture introspection, a state of being that ideally should form the daily reality of a culturally minded and inform poetry writing. Thereafter, pursuing novelty and flaunting wealth was deemed irrelevant. 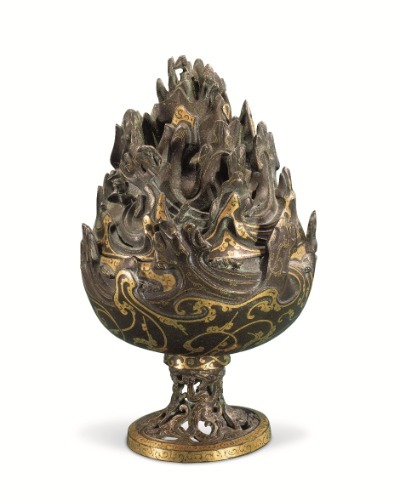 "This new ideal spawned a whole new aesthetic, with golden or gilt silver incense burners featuring intricate decorative patterns giving way to pared-down designs, often realized in mutely colored (pale greenish blue, for example) porcelain." Fresco from the Five Dynasties period (907-960) showing a Buddhist monk holding an incense burner with a long handle. This process of localization is inevitable, enabled by a tradition that had extended far back beyond the point of foreign spices' entry, Zhao says.